Home > Uncategorized > Save An Extra 30% Off OXO Kitchen Gadgets From Macy’s! December 5, 2018 Comments Off on Save An Extra 30% Off OXO Kitchen Gadgets From Macy’s! Macy’s has OXO kitchen gadgets on sale, plus save save 30% off with coupon code: FRIEND added to your cart! Square Pop Container, 4 Qt. – On sale for $17.99, and only $12.59 after the above coupon! 5-Piece Pop Container Set – On sale for $49.99, and only $34.99 after the above coupon! Good Grips Y Peeler – On sale for $8.99, and only $6.29 after the above coupon! Swivel Peeler – On sale for $8.99, and only $6.29 after the above coupon! Angled Measuring Cup Set – On sale for $19.99, and only $13.99 after the above coupon! Good Grips 3-in-1 Egg Separator – On sale for $4.99, and only $3.49 after the above coupon! Food Storage Containers, 3 Piece Round Pop Canister Set – On sale for $39.99, and only $27.99 after the above coupon! Good Grips 6-Piece Kitchen Essentials Set – On sale for $39.99, and only $27.99 after the above coupon! 12 Disks Cookie Press with Storage Case – On sale for $29.99, and only $20.99 after the above coupon! Paper Towel Holder, Simply Tear – On sale for $24.99, and only $17.49 after the above coupon! Smooth-Edge Can Opener – On sale for $21.99, and only $13.99 after the above coupon! Kitchen Tool Set, 4 Piece Nylon Good Grips – On sale for $19.99, and only $13.99 after the above coupon! Good Grips Complete 7 Piece Grate and Slice Set – On sale for $29.99, and only $20.99 after the above coupon! Salad Spinner 4.0 – On sale for $29.99, and only $20.99 after the above coupon! Good Grips 3-Blade Hand-Held Spiralizer – On sale for $24.99, and only $17.49 after the above coupon! Good Grips Little Salad & Herb Spinner 4.0 – On sale for $24.99, and only $17.49 after the above coupon! Good Grips Tabletop Spiralizer – On sale for $39.99, and only $27.99 after the above coupon! Good Grips Foldaway Dish Rack – On sale for $39.99, and only $27.99 after the above coupon! Grater, Good Grips – On sale for $17.99, and only $12.59 after the above coupon! Cookie Jar, 3 Qt. Pop Container – On sale for $16.99, and only $11.89 after the above coupon! Good Grips Garlic Press – On sale for $15.99, and only $11.19 after the above coupon! Good Grips 3-Piece Nonstick Utensil Set – On sale for $14.99, and only $10.49 after the above coupon! Peeler Set, 3 Piece Good Grips – On sale for $14.99, and only $10.49 after the above coupon! Drawer Organizer, Expandable – On sale for $14.99, and only $10.49 after the above coupon! Locking Tongs, 12″ – On sale for $12.99, and only $9.09 after the above coupon! Pizza Wheel – On sale for $11.99, and only 8.39 after the above coupon! Good Grips Potato Masher – On sale for $11.99, and only $8.39 after the above coupon! Ice Cream Scoop, Trigger Scoop – On sale for $10.99, and only $7.69 after the above coupon! Good Grips Julienne Peeler – On sale for $9.99, and only $6.99 after the above coupon! Good Grips 11″ Balloon Whisk – On sale for $9.99, and only $6.99 after the above coupon! Sugar Dispenser – On sale for $9.99, and only $6.99 after the above coupon! Good Grips Set of 4 Stainless Steel Magnetic Measuring Spoons – On sale for $9.99, and only $6.99 after the above coupon! 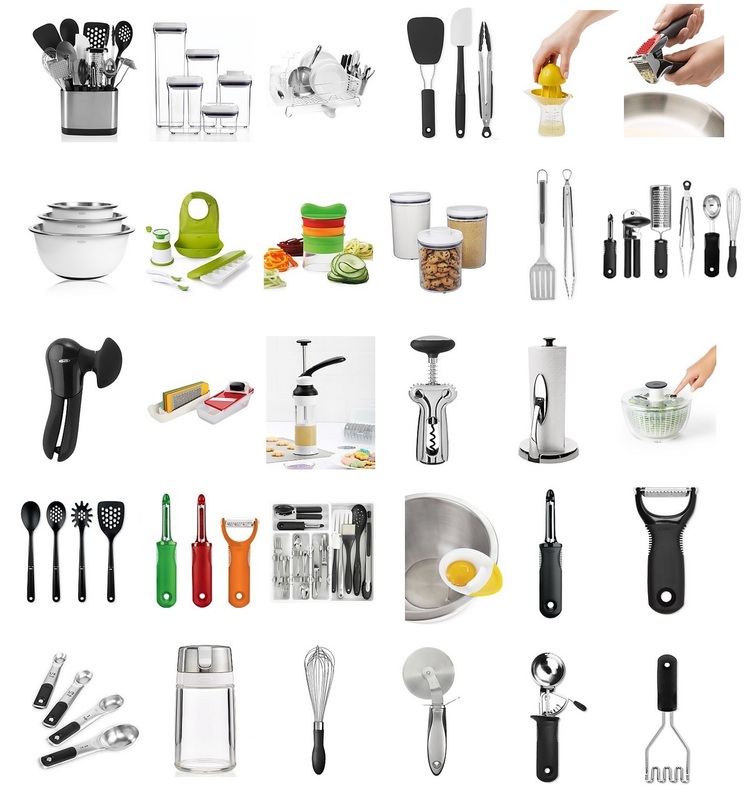 15-Piece Kitchen Utensil Set – On sale for $99.99, and only $69.99 after the above coupon! Dish Rack, Folding Stainless Steel – On sale for $49.99, and only $34.99 after the above coupon!